Click a topic on the mind map for more information or give Andrew a call on 01962 738534 or email. Unravel business issues into concise maps and informative publications. Get agreement on web site structure, content and style. Make sense of complex legal cases. Map a business process until it makes sense and link it to all the relevant documentation. Scope, plan and manage projects. Consultancy – How to solve a problem, make a change, create a strategy, plan and manage it. Using Mind Mapping software to assemble, edit and publish information; electronically and on paper. This can range from writing a book to minutes of meeting. Specific products to suit the legal sector, project managers, conference organisers and many more. 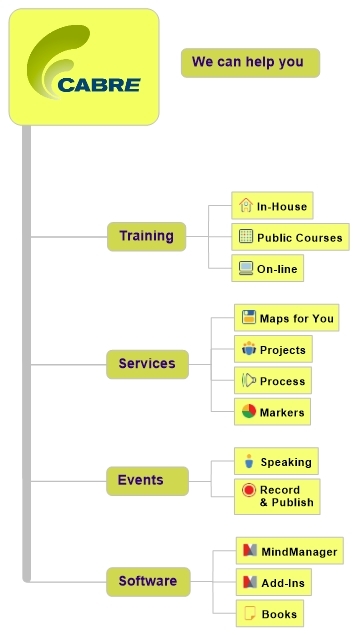 I have never thought about including a mindmap in a website. Excellent idea!